Rookie goaltender Jet Greaves made 32 saves while Ryan Suzuki (13, 14) scored twice as the Barrie Colts edged visiting London 3-2. Dalton Duhart (8) scored the game winner against his former club as Barrie shook off back-to-back home losses to earn the two points. The Knights outshot the Colts 34-21 as Liam Foudy (19) and Adam Boqvist (11) lit the lamp. The Knights saw a three-game winning streak go by the wayside as defenceman Evan Bouchard had a pair of assists. The Colts remain within two points of eighth place Mississauga in the Eastern Conference, improving to 19-22-1-0. London sits atop the Western Conference with a 29-7-4-1 record. The Guelph Storm climbed out to a 4-0 first period lead before the Peterborough Petes scored three times in the opening five minutes of the second to draw within one. That’s as close as Peterborough would come as Isaac Ratcliffe (31, 32) hit the empty net for his second of the night, giving the Storm a 5-3 road win. 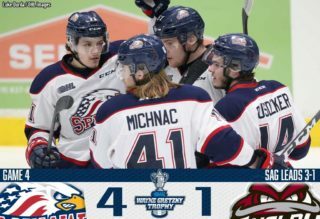 Alexey Toropchenko (12), Keegan Stevenson (14) and Liam Hawel (23) also scored for Guelph while Anthony Popovich made 30 saves. The Storm earn their fourth win in the past five games while Peterborough suffers a third straight loss. Semyon Der-Arguchintsev (5), Erik Cermak (7) and Brady Hinz (14) scored for the Petes while rookie Tye Austin stopped all 16 shots he saw in a relief appearance. Guelph sits two points back of third place Saginaw with a 23-12-4-4 record while Peterborough falls to 22-18-1-1. The Soo Greyhounds skated to their fourth straight win as Matthew Villalta moved into second on the franchise all-time wins list, stopping 32 of 33 shots for his 20th win of the season. Villalta’s 85th career victory sees him surpass John Vanbiesbrouck as the 5-1 road win in North Bay included first period goals from Mac Hollowell (14), Jaden Peca (8) and Roman Pucek (4). Ryan Roth (17) and Zack Trott (6) later scored as well while 2019 NHL Draft prospect Joe Carroll had a pair of assists. Justin Brazeau (42) scored the lone goal for North Bay as the Battalion suffered a third straight loss. Sault Ste. Marie outshot North Bay 39-33, improving to 28-10-4-1 for a five point cushion atop the West Division. The Battalion sit sixth in the Eastern Conference sporting a 21-21-1-2 record. 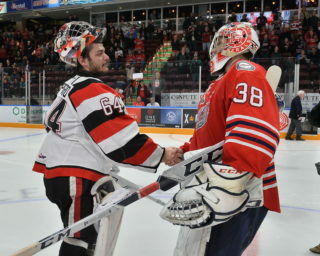 Colton Incze made 22 saves for his first career OHL shutout as the Windsor Spitfires blanked visiting Erie 5-0. Rookie forward Jean-Luc Foudy had a season-high four assists while Dallas Stars prospect Curtis Douglas (17, 18) scored twice for the Spits. Daniel D’Amico (18), Will Cuylle (20) and Cole Purboo (21) also scored for Windsor. Cuylle’s 20th goal of the season makes him the first Spitfires 16-year-old rookie since Taylor Hall in 2007-08 to reach the mark. Daniel Murphy made 27 saves in the loss for Erie as the Otters dropped their second straight on a current five-game road trip. The Spitfires climb into a sixth place tie with Sarnia in the Western Conference, improving to 20-21-2-1. 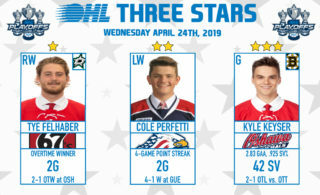 Erie falls to 18-23-1-1, one point back of eighth place Kitchener in the Western Conference. The Niagara IceDogs overwhelmed the visiting Hamilton Bulldogs in a 10-0 rout in St. Catharines. Vegas Golden Knights prospect Ben Jones (24, 25, 26) netted his third hat-trick of the season while Philip Tomasino (21, 22) and Kyen Sopa (13, 14) also scored twice and Jason Robertson had four assists. Jack Studnicka (14), Jacob Paquette (4) and Akil Thomas (19) added singles for Niagara as they outshot Hamilton 41-21 and went 2-for-3 on the power play. 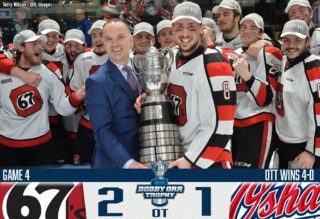 Stephen Dhillon earned his third shutout of the season for the IceDogs as they improve to 25-10-7-0, four points ahead of second place Sudbury in the Central Division. Hamilton falls to 20-20-3-1.